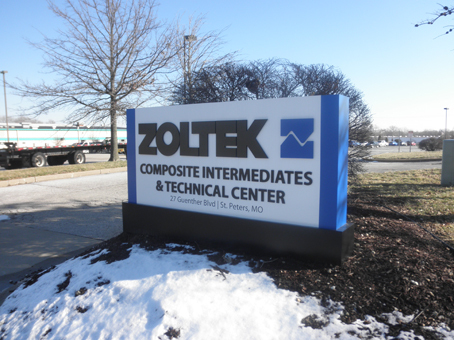 About the sign: Zoltek’s headquarters has great visibility at the intersections of I-270 and I-70. 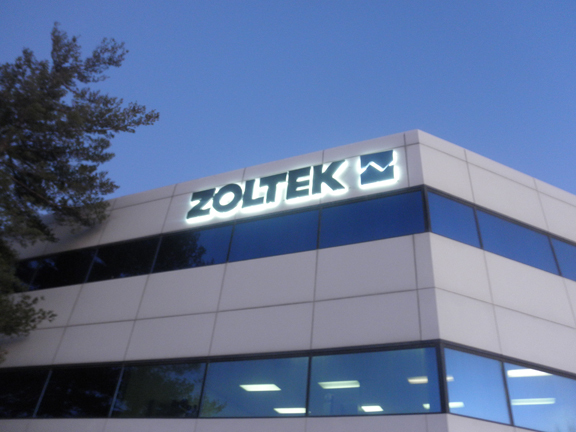 To capitalize on that, Zoltek upgraded their building signs to halo lighted channel letters and logo. The letters are large – 3.5″ tall – and the halo lighting looks amazing as it contrasts with the black and blue faces and as the light bounces off the building. Zoltek’s brand is being highlighted and will now be a landmark for thousands of travelers every day. Zoltek’s mission is to lead the commercialization of carbon fiber as the primary composite building material for market areas that can benefit from its unique characteristics. Carbon fiber is a composite material that is incredibly strong and incredibly lightweight – it’s 10 times stronger than steel and 5 times lighter. Other benefits include high stiffness, corrosion and heat resistance, and electrical conductivity. Many industries and applications can benefit from the higher levels of performance through the use of carbon fiber. You might know that carbon fiber is used in common sporting goods like golf clubs, bicycles, and fishing rods to increase their performance value. There are so many other applications and possibilities for Zoltek’s carbon fiber technology they are too numerous to list – and more continue to be discovered. Go to www.zoltek.com to learn more. 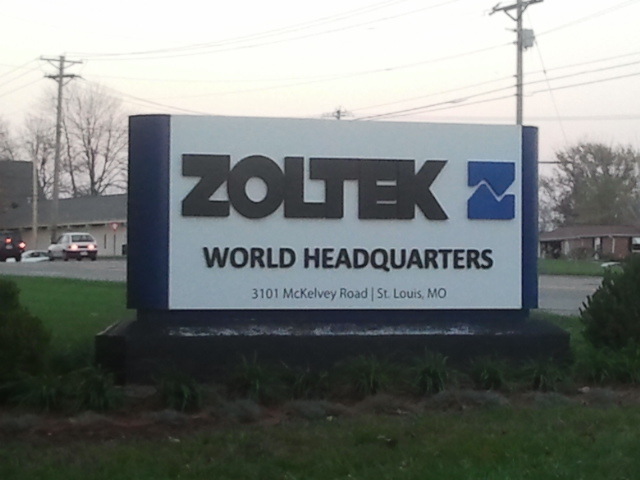 About the signs: Zoltek’s monument sign at their World Headquarters needed an update and they needed a new monument at their new facility in St. Peters so Landmark updated the HQ with new faces and fresh paint and fabricated and installed the new one in St. Peters. Both signs have custom routed, painted PVC letters in varying sizes to give the signs solid looking dimension. 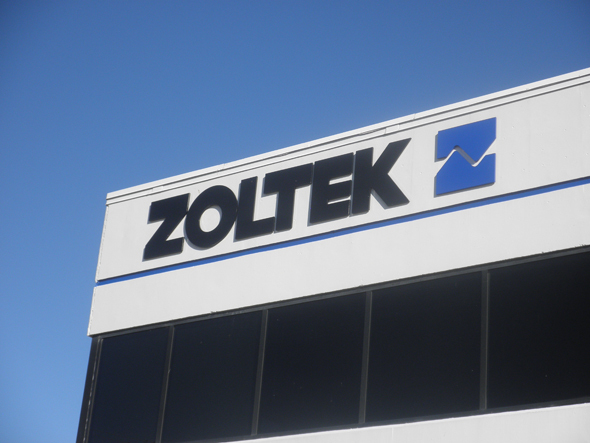 About the sign: Flate cut acrylic dimensional letters like these on the front of the new St. Peters location give Zoltek the prominent brand name recognition in a more economical, non-lighted sign. Landmark fabricated and installed 2 identical signs in St. Peters – one hanging from a custom fabricated frame to hang over the roofline and another above the entrance at HQ. When you are around both these locations you will know you’re at Zoltek!